A recent investigation by the Food and Drug Administration (FDA) into the arsenic content of rice and rice products, found that many food items served to children contain variable quantities of arsenic. The FDA looked at around 1,300 samples of rice and rice products from 30 different food categories. Food categories included plain rice, rice water, rice snacks, pastas and ready-to-eat cereals. The FDA states that the levels of inorganic arsenic found in the food samples tested are too low to cause health damage, though keep in mind these are the same folks who see nothing wrong with BPA in food packaging. The FDA goes on to say that the long-term health consequences of ingesting arsenic are unknown, so the next step for FDA will be to conduct a comprehensive risk assessment related to long-term arsenic in food exposure. Now, in case you’re not interested in waiting around for the results of the FDA research and instead want to play it safe, the American Academy of Pediatrics (AAP) recently posted some tips about how to avoid arsenic in food. The AAP suggests that parents offer children a wide variety of foods, including grains beyond rice, such as oats, wheat and barley. 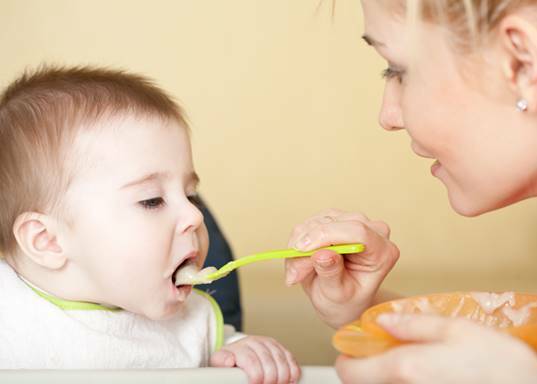 The AAP also notes that many food besides rice cereal make perfect starter foods for new eaters, such as other grain cereals or veggie purees. Lastly, the AAP reminds parents that arsenic has recently been found in juice, but also notes that young children do not need juice in order to have a healthy diet. According to the AAP, they’re currently working with the FDA and other federal agencies in order to come up with ideas about how to limit the use of arsenic in foods given to kids.